UV sensors: Can Evolving Technology Save Your Skin? assess how one might best track UV light exposure. New devices may be useful to monitor sun exposure accumulated in today’s snowy and spring’s sunny climates. ​​For a second recent year, skin sensors have found a place at the annual Consumer Electronics Show (CES) in Las Vegas, Nevada. This year, making its January 2016 debut, was the L’Oreal My UV Patch, a novel stretchable skin sensor. 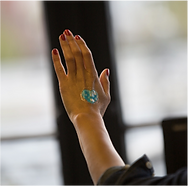 Though still in Beta-testing, the current patch design features a heart-shaped transparent adhesive that adheres to the skin to monitor UV light exposure. 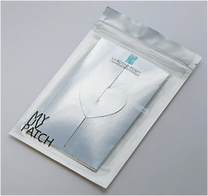 According to the product press release, the patch “contains photosensitive dyes that factor in the baseline skin tone and change colors when exposed to UV rays ….” Using the My UV Patch mobile app, users will be able to upload a photo of the exposed patch for analysis of dye squares and calculation of UV exposure. Both Android and iOS compatibility is anticipated. Those who follow skin tech closely may know this is not the first debut of a UV sensor at the Las Vegas CES. 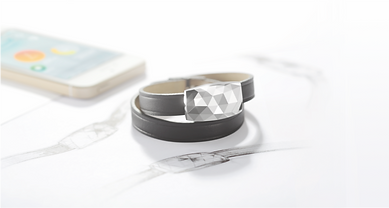 In January 2014, Netatmo introduced JUNE, an ultraviolet jewel sensor with an adjustable bracelet. JUNE functions with an iOS app, which allows the user to determine maximum recommended daily sun exposure and calculate UV dose measured in percentage throughout the day. Its benefits include the ability to track sun exposure in real-time and user receipt of notifications to wear sun protection. 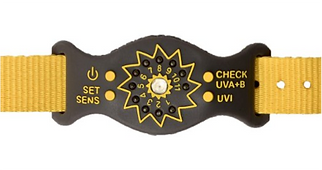 For those choosing instant analysis of sun exposure, one LED device is the SunFriend. This is a wristband sensor that lights up a ring of 11 LEDs as the wearer maximizes daily UV dosage. It features an ability to customize exposure based on personal sun sensitivity and can report a UV index as well. There is no associated app, and the manufacturer reports it is waterproof to three meters. Many other UV sensors function without an accompanying smartphone app. A variety of wristband and bracelet products aim to help reduce sunburns, often using a color-change phenomenon activated by UV light to indicate that threshold UV-exposure has been reached. A similar sun meter UV card is also available to show current UV Index and recommend protection based on it. 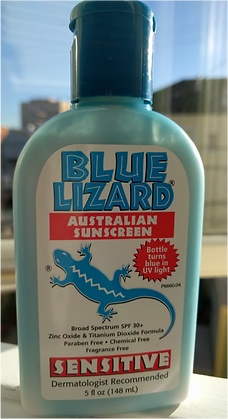 Even sunscreen bottles such as the Blue Lizard brand can remind us to where to wear sun protection. The bottle itself actually turns blue in UV light – convenient! As trackers and data collection become the hip new trend, it’s exciting to see skin sensor technology share the spotlight. If reminders are heeded, sun protection and burn prevention just might reduce incidence of skin cancers! And, that’s all-season skin care progress that would excite any dermatologist. About the author: Angela Walker, MD is a Missouri-native, tech-interested dermatologist practicing in the San Francisco Bay area. Her recent ventures include working to develop new methods of skin care delivery using virtual services. She enjoys educating patients both in the clinics and on-line.